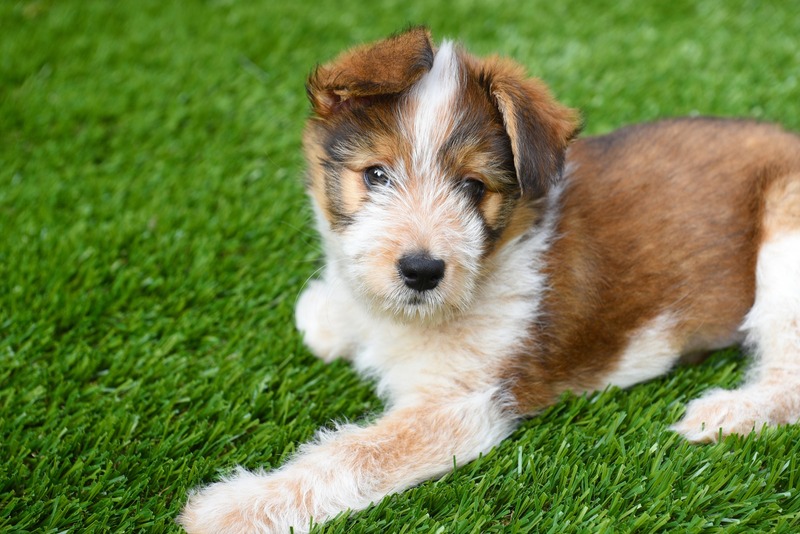 Fake grass is great for dog runs, play areas and lawns, and now, with advances in artificial grass for pets, it is also suitable for heavier-use areas, such as boarding kennels, dog parks and other pet facilities. 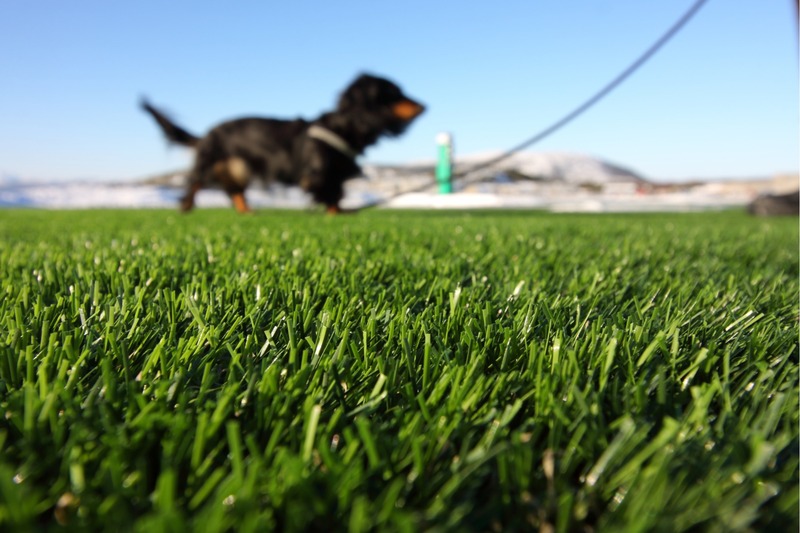 Pet grass technology has come a long way, and most higher-quality artificial grass products now have drainage comparable to or better than natural grass. This makes synthetic turf a viable option for people with pets who are tired of their natural lawn getting brown spots and bacterial build-up in pet restroom areas. To be a viable option, fake grass for dogs and other pets must have great drainage, must be able to bounce back easily in heavy traffic areas, and it must be easy to clean after pets go to the bathroom – plus, it must do all of this while maintaining the look, feel and function of natural grass. It is a bonus that synthetic lawns will not get brown spots like natural grass does when there are areas where liquid waste is repeatedly introduced. While most people concerned about drainage qualities are looking for artificial grass for dogs, this is also something to be concerned about if you have cats, rabbits or other animals that use your lawn. It is important to note that even homeowners with no pets may still need to look for synthetic turf designed to withstand traffic and use as a pet restroom, since dogs out for a walk with their owners or neighborhood cats may use your lawn for bathroom activities. Most higher-end artificial grass products will work in this situation because of the newest pet grass technologies that are incorporated. But, for those who have dogs or know their lawns will be used often as a restroom, it is important to let your design consultant know so that they can point you towards the right products and recommend the best infill and installation to fit your needs. Install-It-Direct uses high-quality artificial grass products from Global Syn-Turf (GST), which is a company that consistently stays on the cutting edge of synthetic turf technology. Flo-Rite-Thru is one of the technologies found in all GST pet grass products, which means that any of these fake grass options are suitable for yards with pets. The purpose of Flo-Rite-Thru technology is to provide turf products that look and feel like natural grass but that perform better than conventional lawns or other artificial turf products for yards with pets. This technology extends the life-expectancy of fake lawns used in dog runs or pet areas and reduces unwanted odors that often occur in areas frequently used for bathroom activities. Solid waste is easy to manually remove from any type of artificial grass, and liquid waste can be rinsed away with a garden hose. What sets Flo-Rite-Thru technology apart is that it includes turf backing material with superior drainage capacity. This allows liquid to drain quickly, which reduces odors and allows urine to quickly move beneath the grass into the base layers. According to Global Syn-Turf, artificial grass products with Flo-Rite-Thru technology drains three times faster, which makes these products ideal for folks who need artificial grass for dogs or for homeowners or business owners who need fast drainage. To see Global Syn-Turf Flo-Rite-Thru technology in action, check out this video. Does Artificial Grass Smell with Dogs?